The first notice appeared in Shotokan online News in early 2009. Some time before, the wheels had been set in motion to open the door for my chance to visit. Marion Taylor, a senior member from SKA-East had been there many times, and always praised the people, the city, the festivities and the practices. 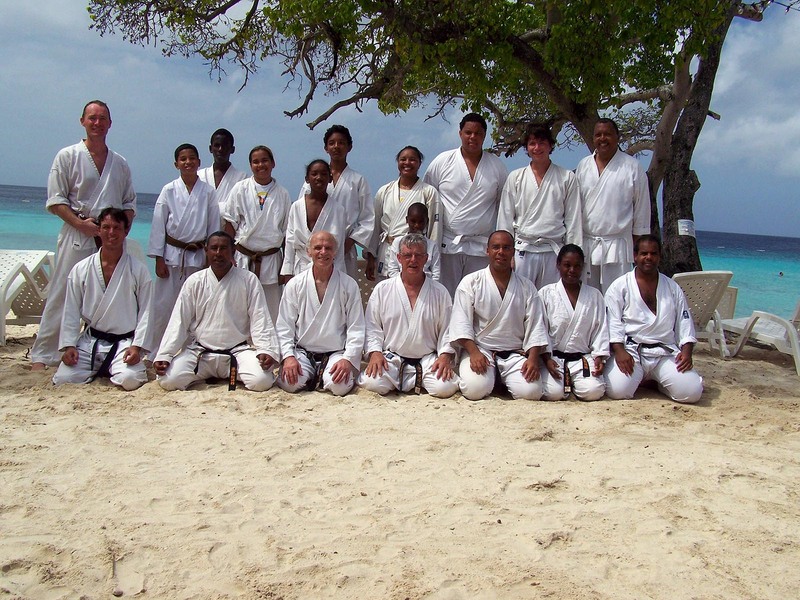 Two years ago Curaçao Shotokan celebrated 25 years, and invited Ohshima Sensei for a very special event orchestrated by dedicated members; it was a total success. Now it was time for me to experience firsthand the character and the spirit of the island and its people! My wife and I had never been to the Caribbean, the annual exchange practice with Shotokan Karate of Curaçao members was the perfect reason to make this our “winter escape.” From our first contact with the organizing committee and the numerous net searches for the best accommodations and flights, I knew that this trip would be remembered and cherished. We decided to vacation on the island prior to the event, with our stay culminating in the exchange practice. First and foremost, I must tell you that the history, strength and beauty of Curaçao are reflected in its people. Everyone we met was friendly, polite and helpful, and never too busy to offer assistance or information. The fact that locals speak four languages — Papiamento, Spanish, Dutch and English — allows the tourist to feel at ease. Just 40 miles off the coast of Venezuela you will find Aruba, Curaçao and Bonaire, part of Dutch territory. Willemstad, the capital of Curaçao, has many satellite districts. We concentrated our visit on Punda and Otrabanda, divided by the entrance channel to the harbor. Punda is on the south side and Otrabanda is north. The Queen Emma (foot) Bridge and a ferry connect the two. When the floating bridge is retracted to let the cruise ships enter the harbor, the ferry takes over and transports locals and tourists to either side of the channel. Punda is the touristy side of the channel, with shops of all kinds, jewelry stores (one at every corner), restaurants, liquor stores and a barbershop (I’ll tell you that story some other time). The floating market was fascinating. Early morning sees fishermen selling the catch of the day, and vendors selling fresh vegetables and fruit (including some exotic ones that I’d never seen before) to passers-by. Otrabanda is more or less occupied by locals, and has amazing shops, and quaint back streets and alleyways that reveal hidden treasures, giving a feel for the everyday goings-on. We visited many beaches along the west side of the island, Jan Thiel, Cas Abo, the Sea Aquarium Beach and Resort (That’s where my wife lived her lifelong dream of swimming with the dolphins. She was on cloud nine for hours following her swim). Private and public beaches that dot the coastline were all very inviting. Sites to see like the Hato caves, Fort Nassau, Land Houses, and a tour of the island guided by Norberto and Raymond, proved unique and very pleasant. We enjoyed the rich history and customs, and received the royal treatment. Their hospitality will never be forgotten, and our gratitude will be long lasting. The last four days of our visit were spent at the Curaçao Exchange Practice. On Wednesday evening at the Plaza Hotel everyone indulged in the welcome reception. On hand were Larry Lazarus, Terry Race, and Norma Silverstein from Massachusetts, along with spouses and local members. Food, drinks and conversation were the order of the night. Everyone was looking forward to our first practice. On Thursday morning we gathered for our tour of the island. Norberto and Raymond were excellent guides, providing information and history on all the sites we visited. Banda Bao was our lunch destination, for local cuisine and brew (Amstel Bright). Our first general practice was at 6pm. Everybody pushed hard to show their best form and spirit. Larry Lazarus led us through a dynamic practice and we all came out recharged and ready for our next get-together. The brown and black belts gathered at 9am on Friday. The senior members had a chance to express their strongest feeling. Larry, ever vigilant, offered guidance and encouragement, and pushed all of us through the doors of learning. The focus was on kumite drills and applications, for a very strong practice. The second general practice was at 4pm. Adults showed their best techniques and the kids were just as impressive. 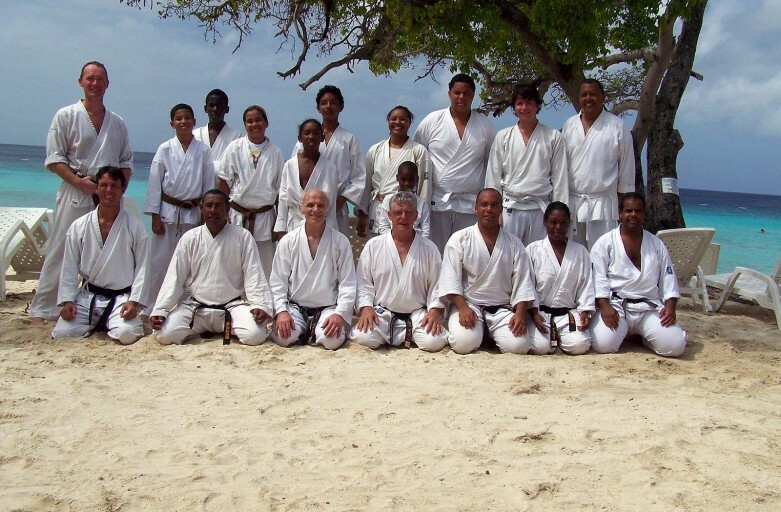 The future of karate in Curaçao is in good hands. The parents of a junior member were on hand with cake and soft drinks to celebrate his birthday. It’s nice to see the involvement of parents and spouses. The 9am Saturday general practice of kihon (geri) and kata was jam-packed. It was followed by lunch in the city, again local food and appreciated by all. The second practice of the day was kata, for all ranks. At the end, Larry asked each of the black belts to demonstrate their favorite kata, and offered advice on ways to improve. Always the ambassador, Larry was very positive in his comments and offered encouragement to all. After a quick turnaround (back to our hotel to shower, change and recharge) we headed out to “Wok Night,” at a really great Asian-Cuban restaurant. The place was jumping, with people swaying to the beat of some fantastic Caribbean music. Sunday was Carnival day, and “The Grand Parade.” We had a bird’s eye view, provided by the organizing committee of this spectacular show. Music, dance, friendship, beautiful costumes, and floats decorated to the max. What can I say but, outstanding! Monday was to be our last full day on the island. There was a practice and barbecue on Cas Abao beach, one of the most beautiful beaches I’ve ever seen. What a place—ocean, palm trees, sea breeze, white sand, great food and drink, and good friends! Our practice focused on kumite, strong spirit, good techniques, focus and determination. Later on Monday evening, seniors and spouses met for dinner and goodbyes. We were all very grateful to Larry for leading a strong and vibrant exchange practice. The next morning we had an early ride to the airport and final goodbyes to everyone. The flight home was uneventful but very pleasant. Montreal, Canada greeted us with minus 10 Celsius, just as a reminder that Old Man Winter was not done yet. Next year, when the 2010 Curaçao exchange practice comes around, don’t miss your chance to visit paradise.